Currently, I have three 4’x4′ boxes that are just one level deep (about 6″). My plans are to convert these to 12″ deep. I have gravel around my SFGs, which makes it easy to mow my lawn, but the gravel really heats up the soil and plants. I am hoping that doubling the height will help this. I also hope it will keep my puppy out of the gardens, and that they will look more attractive. I also plan to build two more boxes, one 4’x4′, and one 8’x4′. 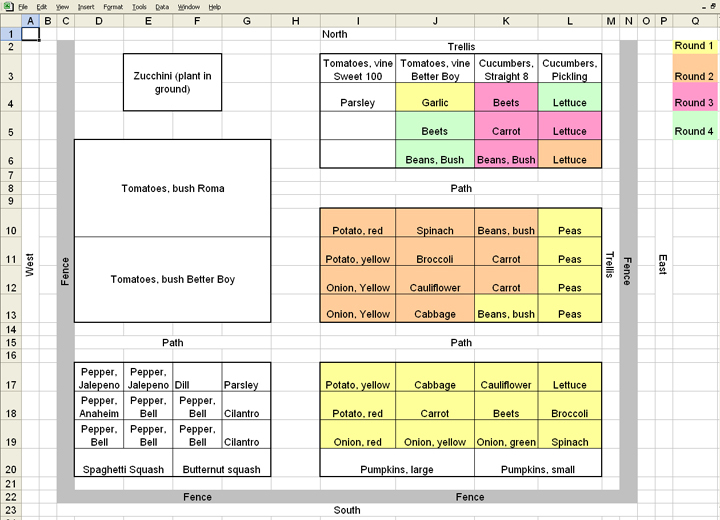 I will grow just tomatoes in my 8’x4′, and I’m going to try an experiment supporting them. As you can see on the main page, I built a PVC support for my corn. I tied nylon netting horizontally to hold it up in the wind (and it’s a good thing I did–it gets windy here!). I am going to make a similar support for my tomatoes, but do multiple layers as it gets taller. I hope to have HUGE tomato plants that are easy to get to–I’ll let you know how it goes! Some of my goals are to can salsa, diced tomatoes, stewed tomatoes, and marinara sauce. So, I’m planting one bush of roma tomatoes, and another bush of Better Boy. I will also grow a Better Boy in just one square; I will prune and trellis it. I will plant lots of peppers and onions as well. My plan is to start my spring planting in the existing beds–hopefully I will get a chance to build them bigger first. If not, I’ll wait until my spring crop is in, then upgrade the bed. I have divided my spring crop into four rounds, to stagger my harvest. So there it is–I’ll keep you posted!